"We must face the facts. The Daleks are closing in on us." The Doctor's Time Path detector shows that there's another Time Machine on the same route as them. It's the Daleks pursuing them. The Doctor believes they have a 12 minute lead. Oooh, a lovely shot of a Dalek being moved in an open lift opens our look at the inside of the Dalek time machine which contains two movie Daleks, minus their oversized basis, to make up the numbers - look either side of the ramp. The Tardis materialises in the present day in the viewing gallery of the Empire State Building in New York. A tourist from Alabama, Morton Dill, tells them they're in 1966. He's convinced they're making a movie. The Tardis crew don't stay long not wanting to imperil New York's residents, but Shortly afterwards the Daleks arrive and showing surprising restraint don't exterminate Dill,leaving promptly. 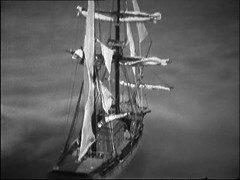 The Tardis next materialises on a sailing ship. Barbara wanders off and is found by the crew thinking she's a stowaway. Vicki knocks Barbara's captor out and then accidentally clouts Ian too! 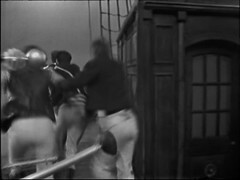 They carry him back to the Tardis which dematerialises leaving the crew searching the ship for their missing stowaways. The Daleks arrive scaring the crew who jump overboard - we have our first instance of someone running upstairs to escape a Dalek yet a few moments later there's a Dalek standing on the upper deck only accessible by stairs. A Dalek is lost when it falls into the sea pursuing a crew member. 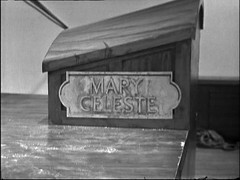 The ship's name is revealed to be the Mary Celeste. 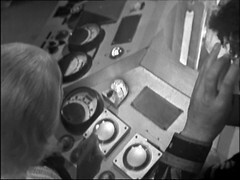 The Doctor reveals their lead is reduced to eight minutes and that the Daleks are closing in. 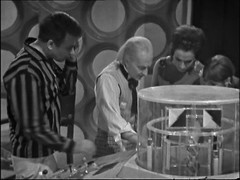 This is essentially a comedy episode, a bit of light fun, with the Tardis crew and the Daleks dropping in on two locations before leaving again very quickly! DOCTOR: That's my Time Path Detector. It's been in the ship ever since I constructed it. But do you know, I don't remember it registering before? BARBARA: What does it show? DOCTOR: Well, it surveys the time path we're travelling on. The fact that it's registering can only mean one thing. IAN: Well, yes, go on. DOCTOR: It's another time machine travelling on the same route. So..... Is it the ship or the Time Path Detector that the Doctor constructed? This story marks the first time another race gains time travel. There's nothing to date the Aridus episode at any time different to that in the Dalek control room or other than the 1966 of the Empire State Building but we know that the second half of this episode occurs before the first confirming the Daleks time travelling ability. 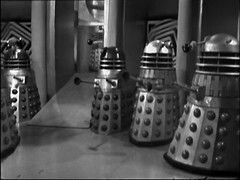 The Daleks will continue to time travel using the technology in The Dalek Masterplan, Day of the Daleks, Resurrection of the Daleks and Remembrance of the Daleks. Elements of the Dalek ship appear modelled after the Tardis: note the central column! 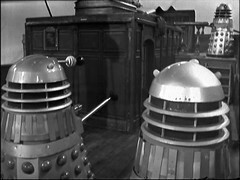 There's a couple of odd Daleks on the time ship, at the base of the ramp down from the lift. Neither of them have a base or power slats and their domes are different colours. This is because they're props reused from the first Dalek film! 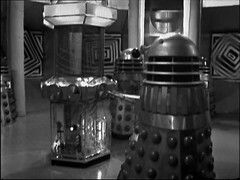 We find out this episode that the Silver eyed Dalek, unlike the Supreme, hasn't had a respray. He's in the left photo bellow just entering picture. Annoyingly I can't get a good shot of the Dalek and his eye in the same picture. He's also visible on the right of the right picture, but with eye obscured. You can see the holes for the hinges that he had fitted for Space Museum again! The right picture also should be used every time someone says Daleks can't climb stairs. There's Daleks at different levels of the ship so at some point a Dalek must have either gone up or come down the steps from where the Time Ship lands, which we don't actually see! DALEK 4: Compute time lag by earth scale. DALEK 5: Er, one, er, forty, er. Computer reading one five earth minutes, reducing. The Empire State Building sequence, nicely set up by some stock footage of New York, features someone we've seen before under make up: The Tour Guide is played by Arne Gordon who was the Menoptera Hrostar in The Web Planet episodes 2 & 4-6: The Zarbi, Crater of Needles, Invasion & The Centre. 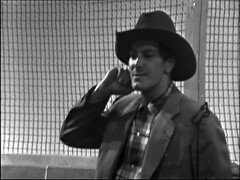 He's the first of a number of actors from the Classic series to achieve this feet: Ian Marter appears first as Lt Andrews in Carnival of Monsters before joining the Tardis crew as Harry Sullivan while Colin Baker shoots the fifth Doctor in Ark of Infinity before becoming his replacement a year or so later! 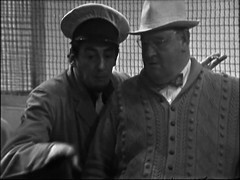 Two members of UNIT were in the series prior to their regular roles too: the late great Nicholas Courtney was Bret Vyon in Dalek Masterplan many years before he became Brigadier Lethbridge-Stewart and John Levene was both a Cyberman and a Yeti before appearing as Sgt Benton. The new series has achieved the same thing three times: Freema Agyeman was a Torchwood agent before joining the Tardis crew as Martha Jones while Fires of Pompei features Karen Gillan as a Soothsayer and Peter Capaldi as Caecillius later to play Amy Pond and the 12th Doctor respectively! Curiously the phenomenon has also been seen in reverse: Jacqueline Hill, Barbara Wright, returns many years after her departure as Lexa in Meglos while John Leeson, the voice of K-9, later voices a Dalek. Then there's a "maybe" as it's unclear if Tom Baker's appearance as The Curator in The Name of the Doctor is or isn't the Doctor! The Daleks provide something we haven't really seen in Doctor Who before: a science fiction element inserted into a historical context. We discover that the Daleks are responsible for the real life unexplained disappearance of the Mary Celeste crew. Yes that's the correct spelling of the ship's name! The Mary Celeste's Captain Benjamin Briggs is played by David Blake Kelly. He'll be back in The Smugglers: Episode 1 as Jacob Kewper. His Out of the Unknown episode The Midas Plague is one of the ones that exists and is on the recent Out of the Unknown DVD Set. Dennis Chinnery plays the Mate, Albert C Richardson. He'll be back as Gharman in Genesis of the Daleks and then Sylvest in Twin Dilemma. The character Dr Chinnery in The League of Gentlemen is named after him. Playing the Cabin Steward, the last man off the ship is Jack Pitt previously seen as a Zarbi in The Web Planet and as the Mire Beast in episodes 1 & 2 of this story. He's not done in this adventure yet either but takes a rest for next week's episode! Amongst the uncredited members of the cast Barbara Bruce , a Woman Tourist, is back as Mollie in The Highlanders: Episode 2. 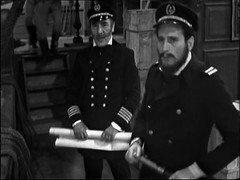 Terry Leigh , one of the Sailors is in Dalek Masterplan: Golden Death as an Egyptian Warrior while another sailor, Bill Richards , makes several return appearances: In the Ark episode 4: The Bomb he's a Monoid then he's in the last two Troughton stories as a Pirate in The Space Pirates: Episode 1 & 4, an Alien Guard / Union Recruit in The War Games: Episode Three and an 1862 Union Soldier in The War Games: Episode Four. He doesn't get an onscreen credit for any of these roles!